But not turned or gusseted. With textured nylon re-enforcement.. (I think I need it.) 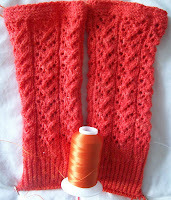 --the nylon I ended up with looks a bit more orange rather than coral or peachy, but you can't see it at all in the flap! These will be my 3rd pair of socks knit with Koigu (it's usually a bit to expensive a yarn for my budget) PPM or the kind with more P's and more M's! I started the re-enforcement 6 rounds or so before I started the actual flap—when I stopped working the lace pattern at the back of the sock, and continued the lace in the front (and end up with about 7 full inches of leg—my standard sock top length). I've continued it in the flap and will continue it into the turning, and might even continue to work the nylon a bit on the bottom of the foot only. The nylon is at the left hand side of sole (where it was dropped in R1. I spool out some nylon, (about 3 times the width of the stitches in sole) and bring a loop of the nylon to right side of work. This will make a big loop of loose nylon. I hold the loop and sock yarn together, and knit the loop. this leaves the 'ball' (or rather spool) end of the nylon on the right edge of the sole. If I have underestimated, the last stitch or two of the sole does not get re-enforced, (and there is a dash of nylon on the inside. Even done with the right sized loop, the last stitch or two is awkward to work. On the next round, the nylon is just where it is needed. It's a bit of PITA—but I will only do it for a half dozen or so rounds –not the full length of the gusset, but just a half inch or so of the bottom of the heel (just exactly where I have found a broken thread in my other Kougi socks!) should be enough. I have done intartia in the round this same way--but intartia is less forgiving! And I have done intaria by looping the yarn into position. I've gotten pretty good and figuring out how big a loop is needed-- but not in any way I can explain scientifically! Duly noted, and filed away for when I actually knit a pair of socks.